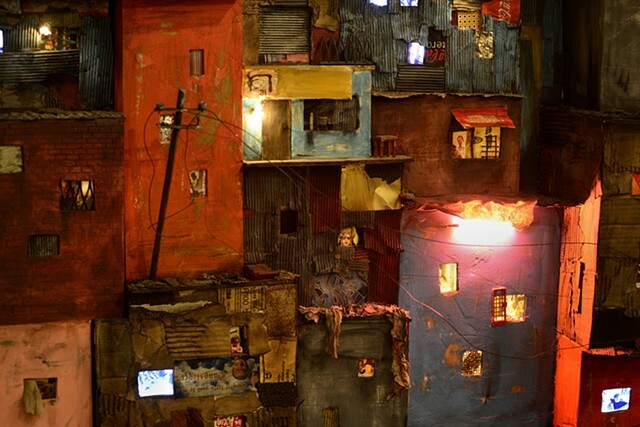 On the back of the wall of shacks, wires, lights, media players, screens, transformers, and raw wood can be seen. This jumble of wires, wood and various electronics echoes the haphazard, often hand-built-out-of-scrap essence found in many under-served areas. I hope to bring a larger awareness to the problem of poverty through this installation, and on a deeper level, to express the full experience of humanity--the good, bad, and in-between. The shacks show the vast array of realities that exist in these places. In videos and images displayed in the windows and doors, people struggle to survive, individuals work hard to make a living or scavenge for recyclables or food; and I also show the darker side of things--drugs and domestic abuse. Additionally, I will explore how religion relates to those that are poverty stricken. Religiosity is highest in the poorest nations of the world. How does someone is such dire need view their circumstances when related to God? My installation captures the delicate tension between the vulnerability and resilience found in these places, both the yin and the yang.